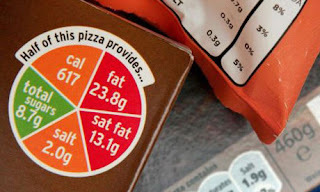 I am studying Nutrition at University and have just had a lecture on Food Labelling in Supermarkets. Do you pay attention to the "traffic light system" on food labels in supermarkets? Or do you just go straight to what you want and throw it in the trolley because its what you want to eat? I do think its important that we take note of what we eat in terms of making an effort to eat a balanced diet but I also think that too much time and worry can be spent on checking and double checking the nutritional contents of everything in our trolleys, and it can become too habitual, obsessive and unhealthy, which is ironic as the whole point of it is to be more aware and...healthy! For those people with eating disorders, it is not at all helpful to be told to check food labels and count calories as this is exactly what a person in recovery is trying to avoid doing. I don't check nutritional information in supermarkets at all. This is largely because I have too much knowledge of calorie counts and fat content already and don't need to look at it again, but also because a healthy diet for me is very different to a healthy diet for someone who may be, say, middle aged with no recent serious illness. Because of my past anorexia, the fact that I need far more than the recommended daily calorie intake to maintain a healthy weight, and that my hormones respond best to a highish fat diet, I don't shun red lights on fat or calorie content. High calorie density is my friend! I do eat fruit and veg, but my digestive system is a bit screwed up and I can't eat vast quantities. Our society is entirely backwards when it comes to weight and diet. Decades of promoting dieting has done nothing to improve the nation's health. The value judgements and good/bad labels attached to food are very unhelpful for people in recovery too. Thank goodness there are awesome people like Laura Collins, Charlotte and the HAES movement pointing out how counterproductive dieting and fat shaming is.